For the best coffees of Colombia. Nothing surpasses our love for coffee, and there’s nothing we’d like more than for our clients to feel the same way. That’s exactly why the team behind Premium Colombian Coffee leaves no stone unturned to deliver the highest quality product for the perfect brew every single time. Following a thorough process that entails hand-picking coffee beans from only the best growers in Colombia and roasting them to perfection, we ensure that each cup of coffee made using our original high quality product radiates the same love and warmth that you’ve grown used to. Using our white label coffee for resale, you can win the hearts of your very own target audience with a taste and texture unlike any other. 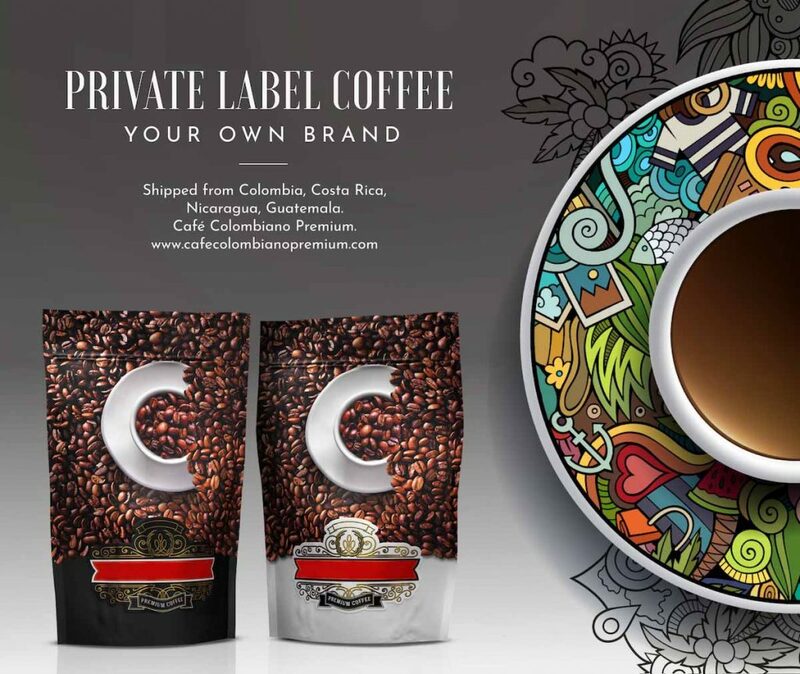 What’s more, knowing how you’d like to build your own consumer base with high quality coffee, we at Café Colombiano Premium also accommodate private label coffeerequests, allowing you to target prospects just the way you’d like. As an OEM coffee company, we at Columbian Coffee Premium also leverage an award winning design that can help keep your customers hooked to your product. What makes our Private Label Coffee different? At Premium Colombian Coffee, we’re passionate about delivering high quality products – and as authorized and certified Columbian exporters, that’s exactly what we do. Prioritizing the satisfaction of our customers and partners above all else, we make use of a comprehensive process to ensure that the quality of our quality is always superior. In addition to keeping a keen eye on all stages of the production process from planting and collecting, to packaging and shipping, our white label coffee process implements strict quality control measures to win the hearts of our clients. We work with Exporters, Wholesalers and Distributors, we offer award-winning products to coffee lovers across the globe that come complete with European and Columbian guarantees. We ship worldwide. Our international clients love our private label coffee service. We are the ideal source for OEM quality coffee. Looking for a supplier for your own coffee label or brand? Being coffee production experts, we understand that you, too, would love to establish a business in the industry. And just like any great friend, we’re here to help. Since we understand that most coffee companies online comprise on the quality of their products when selling for cheap, we’re here to offer 100% original Colombian, Brazilian, Costa Rican or Nicaraguan coffee that will help you make a place in the market. You would get your coffee, freshly harvested and freshly roasted right from the country of your election. It can’t get any better than this! And realizing that the OEM coffee service is still limited in a number of ways, we’re here to make the entire process as convenient and hassle-free as possible for anyone interested making coffee more accessible and available. We ship to your direct from our farms in Colombia. After all, everyone loves a good cuppa joe, right? We also provide our customers and partners with multiple options that they can pick and choose from. Rest assured, our coffee comes in 100% luxury packaging made in the USA and is always delivered fresh. Convinced of the possibilities? Give us a call at +57-15087495 or +34-628744644 (Spain Whatsapp) find out how we can help. Starting your own coffee business is an amazing adventure. If you are new in this line of business, you will quickly see how big this world is and how amazing it is. Coffee is something that will always exist. With so many different coffees around the world, it may seem daunting for newcomers. How to choose qualities? How to find a reliable and trustworthy coffee supplier? How to find a coffee bag manufacturer that sells safe and non-hazardous bags? Bags with high-quality valves? How to start a small coffee business when the minimum order quantities are so huge, container-size orders? Or thousands of bags as minimum orders? Not any Private Label Supplier is Good! Most of the private label coffees that one finds online are from Asia. But if you are looking for the highest-quality coffee in the world, you will find that the OEM coffee for small orders and quantities is not too wide-spread. You will find it extremely difficult to communicate efficiently with South/Central American producers. You will find that language is a major barrier, especially if you are to go into great specifications. One year ago our company created the “Private Label Department”. We are a leading company in Central and South America to provide a premium-quality private label service along with the highest quality coffees existent. Our complete white label service was created due to the high volume of consultations that we constantly received regarding this need. Basically of individuals/small companies/coffee shops/businesses/stores/restaurants interested in selling with their own private brand. You can order any of the coffees we sell in the packaging seen below, in white or black. We send you the coffee bags with the coffee of your choice, freshly harvested and roasted, and shipped by air. Free of charge, we send you by email the premium template of the stickers so you may print them in your country and stick them on your coffee bags. At extra charge, we can prepare the premium labels for you and ship them to you, wherever you are in the world. Given the kind of coffee company and coffee supplier and wholesaler that we are, and the high volume of sales that we manage, our coffee is always fresh – freshly harvested, transported directly out of the best coffee farms, with no intermediation except the premium quality roasting, just hours before express shipping. It simply cannot get any fresher or better. Roasted in Colombia by Colombian master roasters and shipped right after. 25 kgs (55 lbs) is equivalent to 83 bags of 300 grams or 446 bags of 56 grams. Samples:Given the very low minimum order quantity that we have established and the type of product that we handle, it is not possible to send samples of the specialty coffees but we can definitely send samples of the other coffees. We do not charge for the samples – only a fixed $50 or 80-dollar fee for shipping, depending on quantity of samples.